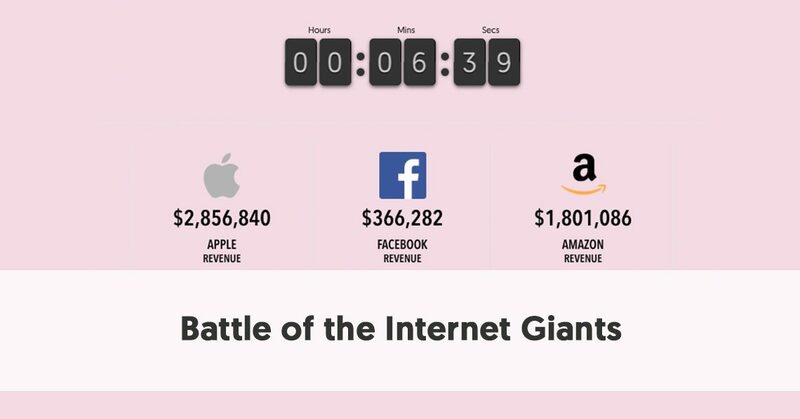 Battle of the Internet Giants | What do Social Media and Internet Companies Make? In the few minutes it will take you to read this post, the wealth of the technology behemoths will continue to grow. The internet giants will continue to slug it out, taking a few dollars for this app and a few more for that online purchase. Apple vs. Android, Facebook vs. Twitter, Microsoft vs. Google, and Amazon vs. virtually every retailer in the world. The battle of the internet giants is mammoth and shows no sign of declining in the foreseeable future. We have developed an interesting tool to look at the real-time wealth accumulation of some of the world's largest internet companies. Look at our real-time visualization of wealth from some of the world's most successful companies. The longer you focus on the tool, the more money they make! Below is a real time visualization of wealth from some of the world's most successful companies. Today’s youngsters may find it hard to believe, but there really was a time before the Internet was a common name. Twenty-five years ago, most people still sent letters, shopped in stores, talked on telephones tethered to the wall, and played games in arcades or on stand-alone games consoles. Sure, the internet existed in the 90s, but it had relatively limited use, mainly by academics and trendsetters. Arguably, the internet began with the invention of the Electronic Data Interchange (EDI) in the early 1960s. This provided an alternative to more traditional forms of document exchange such as mailing and faxing. Also, in the 1960s, MIT’s J.C.R. Licklider popularized the idea of an “Intergalactic Network” of computers. The U.S. Department of Defense awarded contracts for the development of their ARPANET project. Somebody a laboratory at the University of California sent the first message over ARPANET in 1969 to Stanford Research Institute. Development continued throughout the 70s and 80s. Initially, there was a whole range of networks developed independently. Some of the early networks included the NPL network, Merit Network, CYCLADES, X.25 and public data networks, UUCP and Usenet. As each of these was developed separately, they were all different, with no standard protocols and no inter-connection. At this stage, most of the development was done by academics, along with some corporate and government involvement. This was the era of stand-alone computing, and technology giants of this era focused on either hardware (IBM) or software (Microsoft). Apple started to build a niche following at this time, with its Apple II being a forerunner to the better-known MacIntosh. There was a push in the mid-70s to build a specification for a standard network protocol – the rules and techniques for setting up and operating the network. TCP/IP emerged in mid-late 1978 as the winner. This established the ways that webpages were identified, as well as core web features such as hyperlinks. TCP/IP was the protocol behind the internet for its first decade (it was upgraded in 2011 when it became clear that the internet was running out of “space” due to size limitations of that frost protocol). The initial networks, ARPANET in particular, had a strong military bias. They were government funded, so restricted noncommercial uses such as research and unrelated commercial activity. During the 1980s the restrictions eased for education, and they became available for more academic institutions. Even a few companies like Digital Equipment Corporation and Hewlett-Packard were allowed in participate in research projects. This led to the development of further networks, although this time they all obeyed the TCP/IP protocol. The word, “internet” was first used in 1974 as an abbreviation of the term internetworking. In practice it meant, any network using TCP/IP. By the late 1980s, it had begun to mean, the large and global TCP/IP network. Throughout the 80s the TCP/IP networks went global. Multiple networks following that protocol were set up around the world. These, like their US counterparts, were initially restricted to government, military, and educational use. But despite official bans, interest in the commercial use of the internet was increasing. Early internet service providers (ISPs) were formed in the late 80s. The first commercial dialup ISP in the United States, The World, opened in 1989. The US Congress passed a law in 1992, allowing the use of its networks to connect with commercial networks (initially upsetting the research community). The final restrictions on carrying commercial traffic ended on April 30, 1995. The door was open for true commercial operators on the internet. The battle of the intent giants could begin. The World Wide Web (www) is the modern internet as we know it today. Technically the world wide web is a vast information space, accessed by the internet using a web browser (and nowadays apps). Tim Berners-Lee is credited with inventing the World Wide Web in 1989 and developing both the first web server and the first web browser in 1990. The first popular browser was Netscape Navigator, making Netscape arguably the first internet giant. At about the same time, the IBM Personal Computer (IBM PC) was dominating the microcomputer market. IBM (initially known for its mainframe and large-scale computing systems) had introduced the first version of this model in 1981. Before this, all personal computing systems were proprietary, including, of course, Apple. IBM chose to use open standards and outsourced much of its production. Microsoft provided its operating system – DOS. Because of its open-source technology, the IBM PC developed into the world’s standard personal computer. After multiple versions of DOS, Microsoft introduced Windows, which included Internet Explorer – which became the world’s most popular browser for some years. The early 2000s saw the first “dot-com” explosion. Many companies came onto the scene promising to be the next big internet giant. They were propelled to ridiculous stock market prices by speculators wanting to cash in. Many crashed and burned when it became clear that they didn’t really offer anything of great value. Microsoft initially continued to dominate the operating system and browser wars. Apple was one of the few standalone companies to succeed, thanks to the success of the Apple McIntosh. Amazon began its online store, initially just for new books, and eBay became the place to go to buy and sell second-hand goods. Wikipedia took over from Britannica as the encyclopedia king. Technology improved and became cheaper, as kilobytes gave way to megabytes to gigabytes to terabytes. Similarly, most people moved on from the 56kbs of dial-up internet to a range of broadband options. It was during this era that the modern social networks began operations. The first real social network was called Six Degrees, which operated from 1997-2001. The oldest of our current social media giants is LinkedIn, which has been online since 2003. YouTube launched in 2005, once it became technically feasible to stream video to a mass audience. During the mid-2000s the social networks of choice for teenagers were Myspace and Bebo. However, 2006 saw the arrival of Facebook, initially targeted at an adult audience. It was not long before it swallowed most of its predecessors, continuing its staggering growth to this day. Twitter was founded in 2006, and although not quite as popular as Mark Zuckerberg’s creation, it remains popular. There were initially quite a few competing search engines. The first web search engine, released in 1993, was W3Catalog, closely followed by Aliweb. Yahoo! launched a web directory in 1994, although it wasn’t until 2002 that it built its own web search engine. Altavista was launched in 1995 – the first to allow natural language queries. Larry Page and Sergey Brin begin working on BackRub, the predecessor to Google Search, in 1996. They registered the Google name in September 1997 and made Google Search available in 1998. Microsoft aimed to be a major player in the search engine field, introducing MSN Search in 1998. They renamed this Bing in 2009. Before long Google, MSN / Bing, and Yahoo dominated English-language search, with Baidu taking the lion’s share of Chinese searches. Google revolutionized online advertising in 2000, with the introduction of Google AdWords. The revenue from these ads helped fund much of Google’s future expansion. They introduced Gmail in 2004, initially by invitation-only. It subsequently became the most popular email service in the world, again supported by ads. Google began to diversify away from internet-focused products, initially with the introduction of Google Maps in 2005. Google announced the development of its browser, Chrome in 2008, in competition with the then dominant Microsoft Internet Explorer. By 2012, Chrome was the most used browser in the world. Thanks to intelligent product interdictions, and acquisitions of promising services, such as YouTube, Google has continued to rise to the market-dominating position it has today. 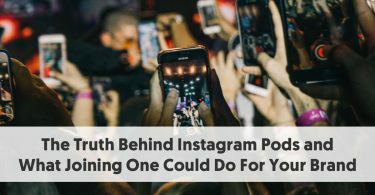 One of their major successes has been Android, giving them an essential role in the mobile revolution of the late 2000s and 2010s. Initially, the battle of the internet giants was totally computer-based. Mobile phones were merely a mobile communications device – you talked on them, texted on them (once 2G was established), and for some time when Nokia ruled, played Snake. Arguably the first smartphone was IBM Simon, released in 1993. It included a calendar, address book, clock, calculator, notepad, email, and a touchscreen with a QWERTY keyboard – but no internet. The third generation of mobile technology (3G), brought mobile broadband, however. By the end of 2007, there were 295 million subscribers on 3G networks worldwide. By 2009, it was clear that there was insufficient bandwidth for existing 3G networks. A 4th Generation 4G was invented, and this has led to a mobile revolution, to the point now that more mobile devices are connecting to the internet than traditional computers. Although there were quite a few attempts at inventing a smartphone in the mid-2000s, it was the introduction of the first Apple iPhone in 2007 the created the market. Apple abandoned previous efforts of using a stylus or keyboard, by introducing the first capacitive touchscreen, with multi-touch gestures. Another change made by Apple was the introduction of its App Store, making it easy to expand your phone’s capabilities. Apple continued its policy of keeping its own proprietary technology. This left a place for Google to come up with a competing operating system, Android -initially partnering with Samsung for the hardware. The mobile revolution has continued through the 2010s, with Apple and Samsung in particular, battling it out for the most coveted mobile title.